Today, at lunch, I stole a gerbera daisy from the Dining Commons. I figure my tuition must cover this, right? 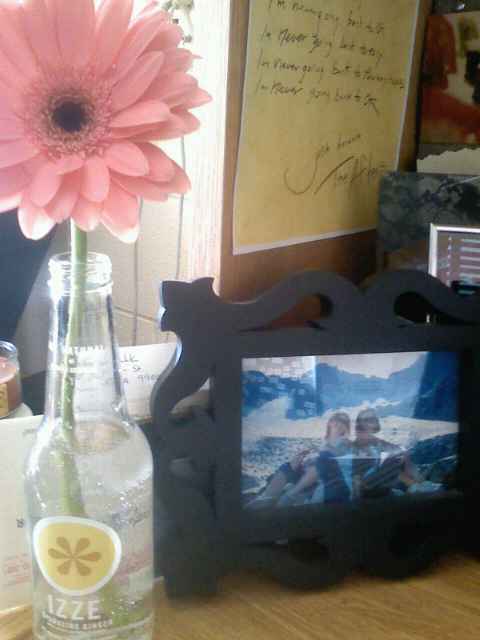 I put it on my desk, in an improvised vase, and immediately felt happy and light. I have no bitterness toward St. Valentine, or the day we use to celebrate him. In fact, I seem to be the campus factotum regarding what Valentine's Day really means. After I finished telling a girl in the Olson kitchen about the great saint and his fight for God's picture of His relationship to us which led dear Valentine to the lions, she asked me if I was a history major. There is more to it than this, however, for me. There is the cool liturgical significance (and that fact that today also happens to be Transfiguration Sunday!) but there is also my personal schema. I've been learning, lately, in my writing theory class, about the wonderful way that our minds create meaning based on the words that we hear and our previous experiences. For example: when I hear the words "Valentine's Day" I suddenly go back to presents at breakfast from my dad, to socks with hearts on them and little bears holding candy. Flowers for my mom. I go back to skating, either roller or ice, every year, and lots of treats for everyone. Back in the days when you bought a box of valentines and gave one to everyone, regardless of romantic intentions. I go back to all of the birthday celebrations that I had which were valentine themed (I was born on the 20th). In fact, I have to say that Valentine's Day has always been a pretty good day for me. With or without romance. So, I'm going to enjoy my stolen daisy. I wish you all many happy returns of the day, and hope that this celebration of God's passionate love for us doesn't stop after today, but continues throughout the year.